I'm new to the forum! We got our 1975 T2 Panel Van three years ago. We got it resprayed two years ago, but unfortunately quite a bit of rust was missed. In particular the panel under the front bumper up to directly under the front door is pretty much all brittle. Not sure how much we can afford to get fully fixed & resprayed right away, but I'm keen to get at least a quote for stopping the rot and checking for any structural damage. I'm at a loss who to trust though. Can you recommend any panel beater shop who know old VWs and are doing a thorough job in Cape Town (ideally Table View, but really anywhere in CPT)? PS: We drove past quite a few stunning Kombis and Beetles on our way to UpTheCreek on Friday - apparently everyone else was going to the car show in George - awesome to share the road! 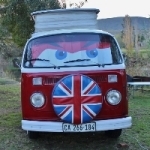 I've had my panel van and one of my bugs done by Ettiene ( 083 454 1896 ), I cant remember the name of his shop now. He is behind Wingfield motors in Goodwood. The shop looks like crap, I have to say that, but his work is well above average and his prices are good. He isnt a "panel replacer", him and his partner are old school panel beaters who replace steel with steel in the way we want it done. If you want to see my projects, I'll be home in April and you can visit to see his work. The name is Acre Autobody. I met you at the Engen petrol station on the N1 on Friday while we were heading up to George. The issues you have on your bus were due to cheap repairs using body filler to cover up rusted areas. Replacing panels with new ones will be best. Recommending panel beaters is risky. Everyone has there own preferences or levels of quality acceptance. This panel beater above may be acceptable to some, but maybe not to you. Pricing will give you a guide. You must realize that the cheapest price will not give you high end results. General panel beaters may be good at spray work, but rust removal they are not good at. 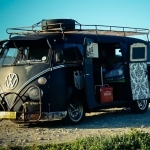 Does your bus live outside? Rememeber any classic car will be rusting in no time if it lives outside. Inside a dry garage is the only way to preserve a classic. it was great to meet you on Friday! Thank you for your comments - makes total sense. Right now, I'm looking to stop the rot. With the view to do it "proper" once we have the "spare budget". I definitely want to get the panels replaced rather than just filled in. Just a question of when. Our Kombi now lives in a garage - it didn't before. I originally "found" Etienne from Acre years ago when i needed a fibreglass speedster refurbished. I was very impressed with his repair work on a fractured piece of the body, and the paintjob was impressive. When I bought my kombi, I need the usual rust areas cut out and repaired, which he did. No filling in, all old rust was cut out and replaced with metal, and then I got the Kombi painted based on what I was building, being a red and white two tone scheme. His price was very acceptable considering I'd received quotes in excess of 80 K.
I have shared his details with other Bus owners (Tony) and they've all been happy with the quality of his work. His time management is bad, but he gets the job done, and to my expectations.